Interest in mushrooms is, if you’ll excuse the expression, mushrooming, as growing numbers of people seek food from local, sustainable—and even foraged—sources. Thanks to a vibrant network of farmers’ markets and an expanded offering of mushrooms sprouting up in the produce section of grocery stores, most of us can lay our hands on an interesting variety of mushrooms without heading out on a mushroom hunt in the woods. The most commonly available mushrooms are white buttons, baby bellas, and portobellos. Some wild varieties—such as oyster mushrooms with their wonderful almost fishy fragrance—are now being cultivated and sold in supermarkets, while others appear seasonally in open markets. I’m always happy to see one of my fall favorites—hen of the woods—among the autumnal produce at the farmers’ market, and local mushroom hunters sometimes supply the markets with morels in May. 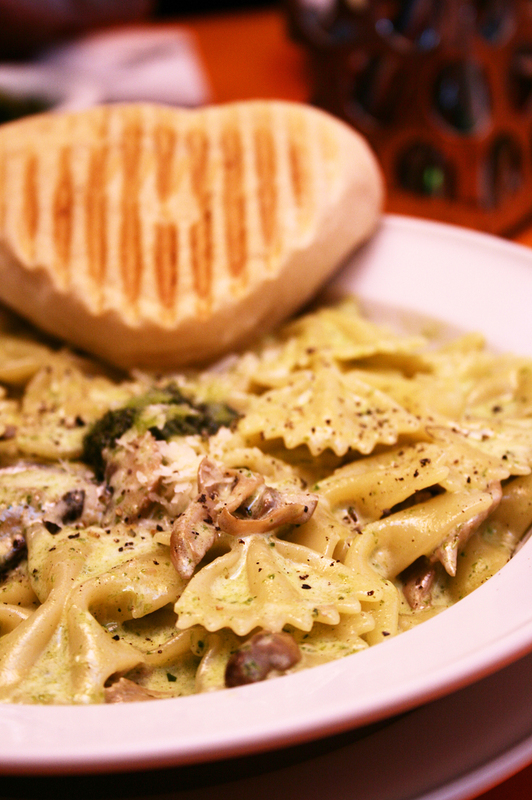 Farfalle with fresh mushrooms and a sprinkling of herbs hits the spot. Mushrooms can add flavor and texture—and a surprising nutritional punch—to many meat dishes, but are robust enough to carry a hearty, vegetarian meal. Portobellos are a particularly good substitute for meat patties. Lightly brush the caps with olive oil and grill them, first on the gill side, then on the cap side. Remove when tender but still firm and place on a grilled burger bun. A slice of Monterey Jack or Swiss cheese can turn the dish into a “portobello cheeseburger.” When topped with tomato sauce and cheese, the grilled caps can also make a “mushroom pizza.” You can always add cream to stretch the mushrooms and make a creamy, filling dish without meat. Chopped and sautéed mushrooms can provide a rich and satisfying filling for puff pastry and quiches. Many people mistakenly believe that mushrooms have little nutritional value, but they are a great plant source of vitamin D, and also contain high amounts of other vitamins and minerals, including riboflavin, niacin, and potassium. 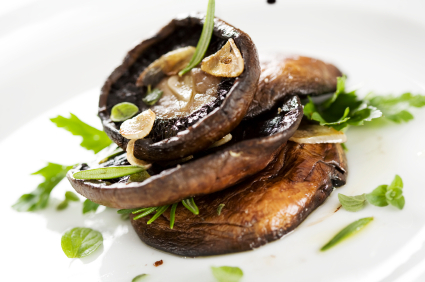 A sprinkling of herbs brings out the natural flavor of portobellos. Thyme or sage added to chives are my favorite herbs to combine with mushrooms. I enjoy seasonal fall and spring mushrooms sautéed and then added to vegetables or pasta. Especially good is the hen in the woods with butternut squash ravioli and sautéed sage. Look for mushrooms at our bi-monthly Farmers’ Markets this fall and at our annual Fall Bulb Festival market.